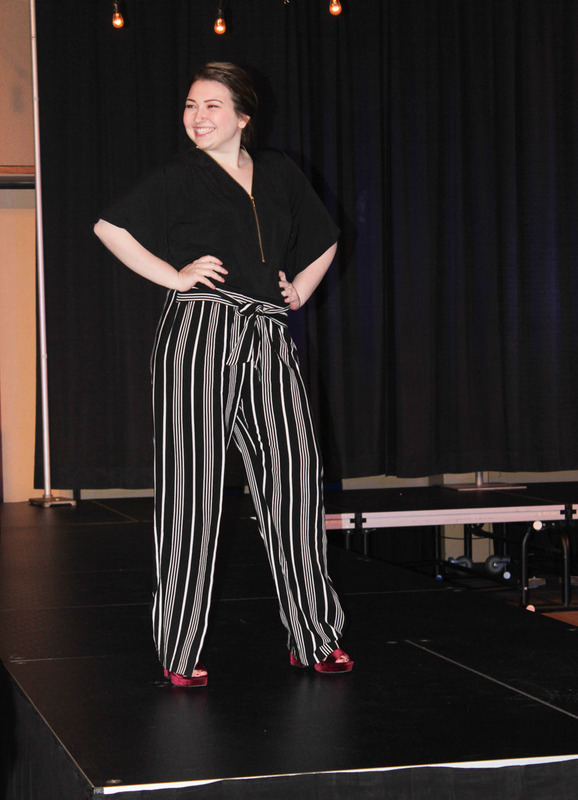 Youngstown community members and students alike gathered in Kilcawley Center’s Chestnut Room at Youngstown State University on April 4 for a fashion show in celebration of all body types. Jennifer Frank, merchandising: fashion and interiors instructor, was at the forefront of the fashion show, which was put on by the students in her production and promotion class. Frank said the fashion show is a way to honor the memory of former student, Danielle Peters, who passed away due to complications of bulimia in 2012. “Beauty does not come from the size of your jeans or dress, but what is in your heart,” she said. Guest speaker, Nina Schubert, shared her battle with body image and an eating disorder with the audience. Schubert said her body image issues developed at a young age, and it was hard for her to admit there was something wrong in her adolescent years. She said she is now four years into recovery from an eating disorder. “I got out of my program about a year ago, and when I got out I became very vocal on my recovery because I came out stronger than ever before,” she said. Schubert said she is now able to enjoy life to the fullest. She shared a message of self-love with the audience. Cortni Bowser, senior social media communications major, and Madalyn Baker, sophomore merchandising: fashion and interiors major, were in charge of the outerwear collection. Bowser said she initially didn’t know the meaning behind the fashion show, but after learning it was about raising awareness for eating disorders, it meant so much more to her. “We wanted to make the clothing aspect of the show a success, but we also wanted to give eating disorders a clear recognition,” she said. Bowser said she learned from the fashion show production and promotion class that more goes into a show than meets the eye. All of the clothes were borrowed from TJ Maxx for the night of the show and all of the students were responsible for finding their own models. Baker said she doesn’t think most people realize how much work and effort goes into organizing a fashion show. 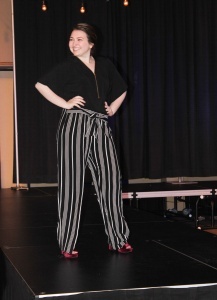 Krissy Davis, senior psychology major, modeled professional attire in the show. Davis said the show did a great job of leading by example and showing that everyone should accept and be happy with their bodies. “My favorite part of the show was being able to interact with all of the amazing people who came together,” she said. Davis said the show did a great job of leading by example and displaying that everyone should accept and be happy with their bodies. “A lot of us were nervous to model for the first time, but we embodied the message of the show itself by encouraging each other to stand tall and be our best selves,” she said.